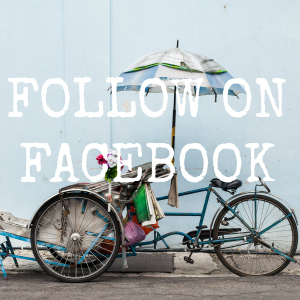 We had been on the road for almost four weeks on the day we left Fremantle, Perth had seemed so far away when we set off from Broome back then and now continuing the journey to Melbourne seemed unimaginably long: we had merely covered around a third of the distance. With his new lick of bonnet paint and shiny new registration plates Chad was going strong though. If we had been worried he wasn’t going to get us to Victoria when we bought him, we had no such feelings now, to us he seemed invincible, yet it took him a while to start up the cold, often damp mornings we began to encounter . 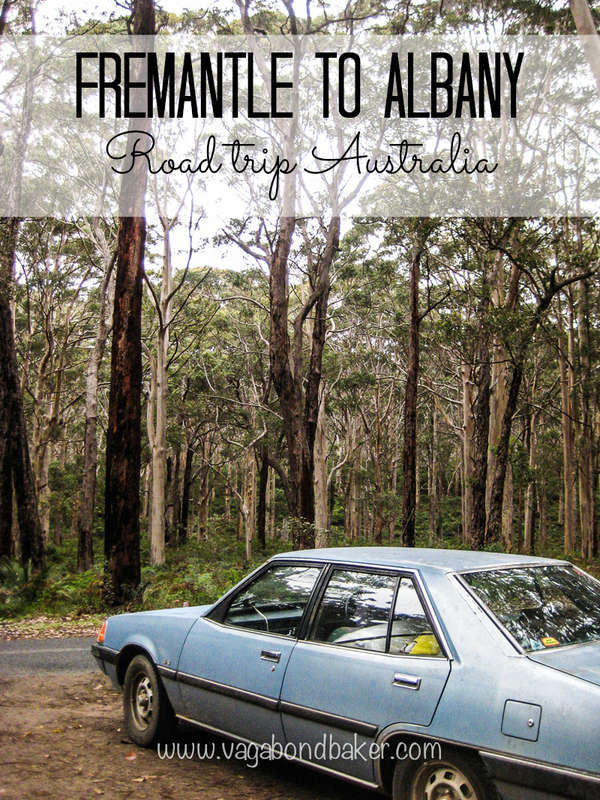 This next stretch of the road trip would take us down to the southern tip of Western Australia – we would get attacked by a parrot named Eddie, and I would face my fears climbing a humongous tree – before heading east towards South Australia. On the road out of Fremantle we detoured off the highway to a coastal road just south of Mandurah to see the thrombolites in Lake Clifton. 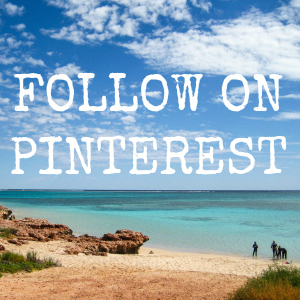 Remember the amazing stromatolites in Shark Bay – the ‘breathing’ rocks that gave us our atmosphere? Well these thrombolites are essentially the same thing only in fresh water. The lake water was high, completely submerging the thrombolites but we could see them, pale blobs of rock under the choppy surface (not particularly photogenic so I have no photos!). We didn’t hang around long, it was blustery and cold out on the wooden boardwalk overlooking the miraculous sunken stones. 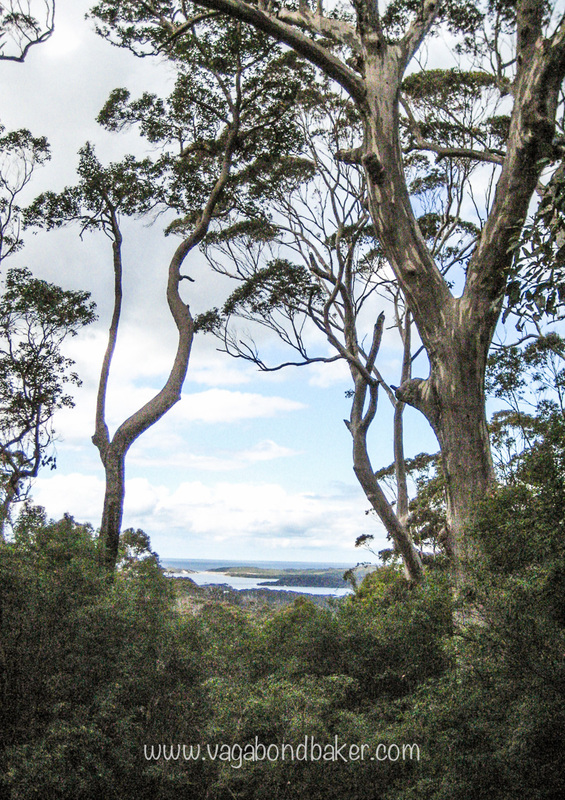 Continuing a little further south we reached The Leshenault Peninsula Conservation Park near Bunbury with the idea of camping at the National Park campsite there. We had the place to ourselves, it was set on the edge of a large area of wetland and the estuary was awash with beautiful black swans. Driving down to the Belvedere campsite to have lunch large signs everywhere warned of mosquitos carrying the Ross River virus, this was a little worrying. We ate our sandwiches then decided to press on to Busselton: mozzies are bad enough but mozzies carrying grim tropical diseases are worth avoiding, especially when we didn’t have good insect repellent. From the mosquito-ridden, wild camp at Bunbury, the Kookaburra Caravan Park in Busselton couldn’t have been more of a contrast: neat lawns and leafy avenues of caravans and trailer tents, there was little chance of a tropical fever here. 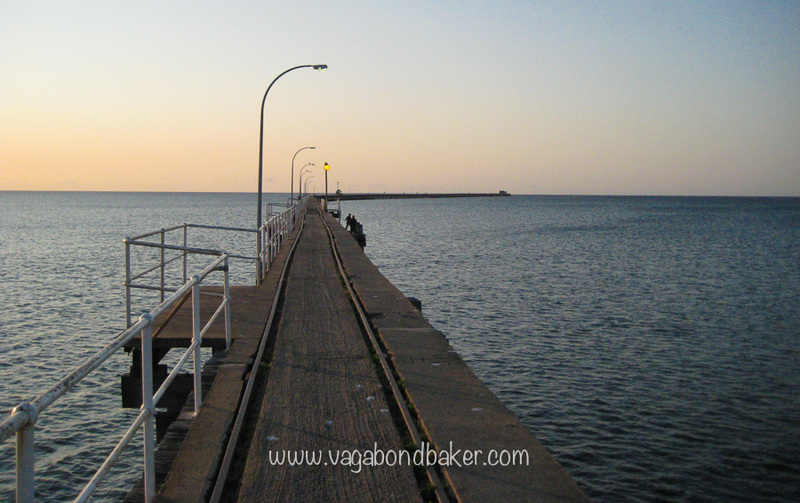 We walked down to Busselton’s famously long jetty, marvelling that it is the longest wooden jetty in the southern hemisphere at almost 2 kms, oh these southern hemisphere facts! Over the water the sun was setting and a few people were fishing along the length of the narrow pier, the wooden walkway was stained with cuttlefish ink splatters giving a clue to what some of the people may be fishing for. 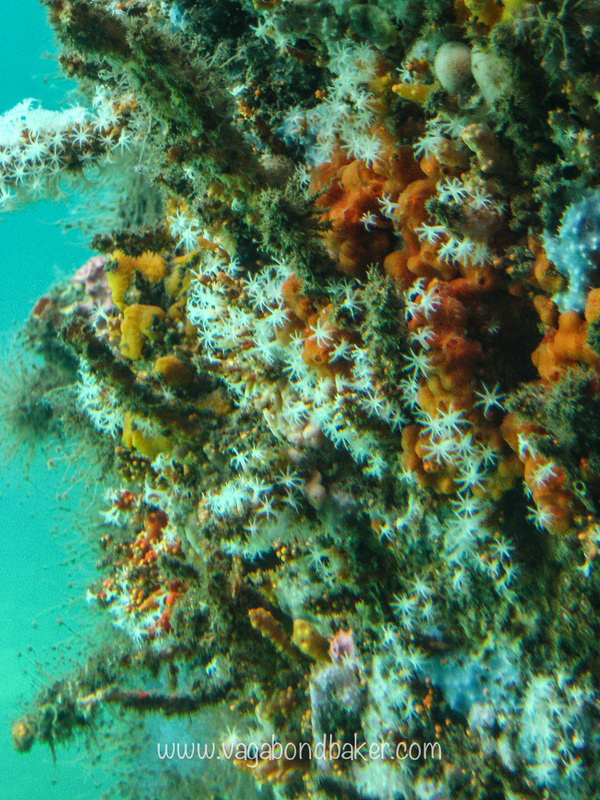 Peering down into the bay we could see that underwater the timber piles were crusted with colourful corals. 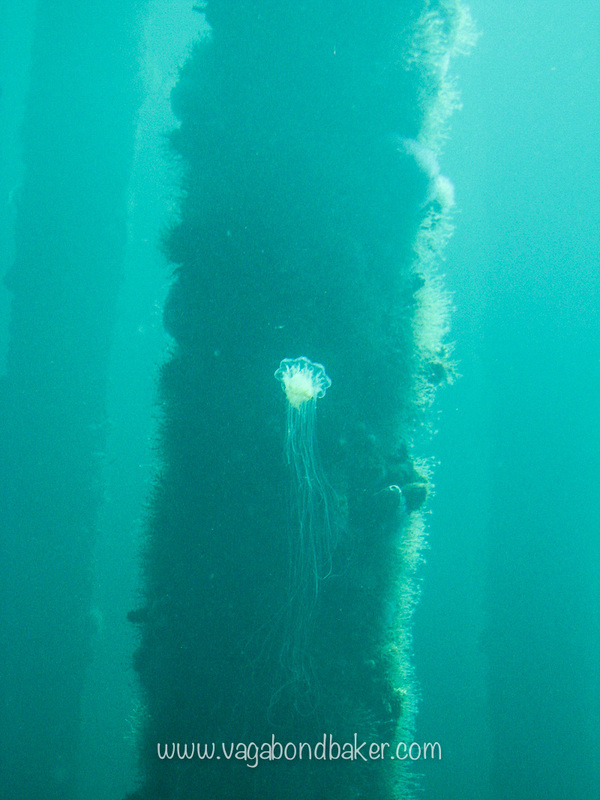 The following morning we went back down to the jetty to visit the underwater observatory near the far end of the pier. It was a little over our budget but after seeing the corals the previous night we were keen to see it from below. A guide took a small group of us down a spiral staircase to an observation chamber on the sea bed, some eight metres below the jetty. Tall windows gave vision out into the bay: the jetty posts, like jewel-encrusted trees, marched outward, lit entirely by sunlight. 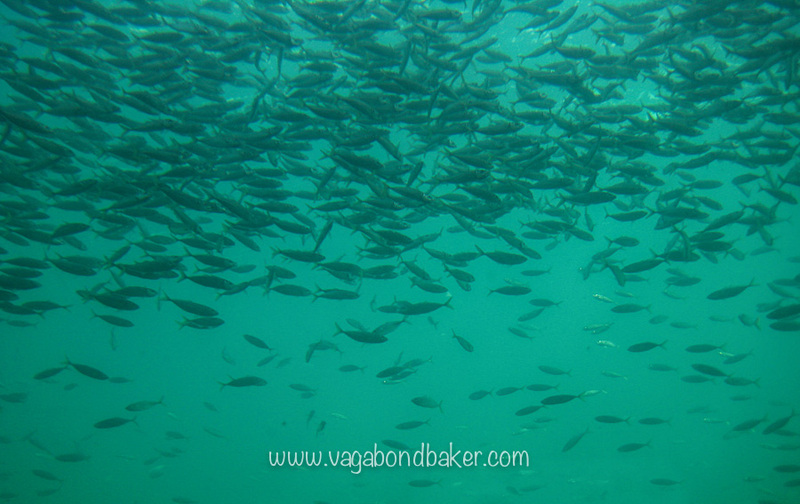 Large shoals of fish swirled around the posts, glittering as they passed across the glass. A couple of dainty white jellyfish floated down like Victorian parasols while pretty fish grazed around the corals. A sudden splash above and a cormorant sliced through the water, its sleek body leaving a stream of bubbles as it dove deep, effortlessly swimming down with its webbed feet, its wings held tight and invisible around it. The Busselton Jetty Observatory is definitely worth a visit, a mesmerizing opportunity to experience the vibrant life in Geographe Bay. 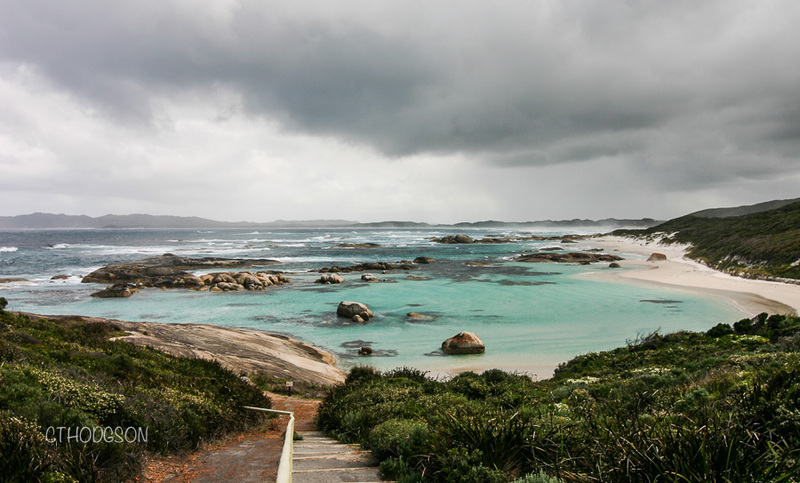 We drove up to the Cape Naturalist headland of the bay to eat our sandwiches, walking out to the whale watching platform just in time to see a couple of humpback whales breaching and spyhopping! We were visiting in early september yet a few months later we could have seen blue whales, as they use the gentle curve of the bay as a resting area on their migration. How amazing would that be! 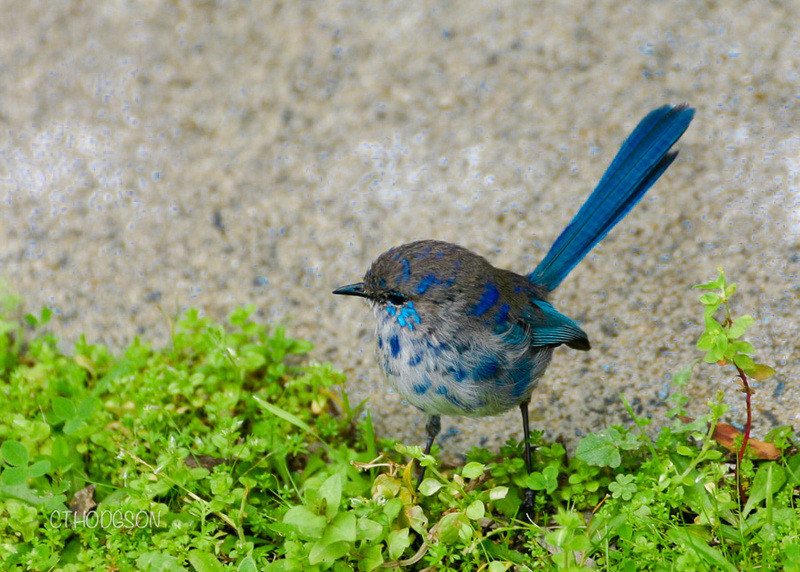 A tiny fairy wren hopped around the car park near the viewpoint, so iridescent! This tiny fairy wren hopped around the picnic site! The road south cut through peppermint trees, the woodland floor was carpeted with white lilies, it was a strange to see them growing so abundantly. We soon entered wine country, acre after acre of vineyards lead us down to Margaret River. Underground the area is riddled with caves, a few of which are open to the public as show caves: the subterranean rivers gifting water for the vines. The Leeuwin-Naturaliste National Park provided us with an inexpensive campsite for the night, deep in the forest we pitched our little red tent at Conto’s Field Camp which had an excellent camp kitchen complete with hobs and a sink with washing up liquid! We could have a fire! Camp fires had been banned everywhere up to this point and we soon made a fire in the fire ring courtesy of a very generous woodpile. The ranger came round after dark to collect our camp fee. When we had arrived the camp had been completely empty but as night began to fall more and more campers appeared. We were joined at our campfire by a young German couple who were in an ’84 VW camper, while we sat talking a large rat-type animal (a possum?) came right up to us, its eyes reflecting the torchlight, it was difficult to make out what it was! 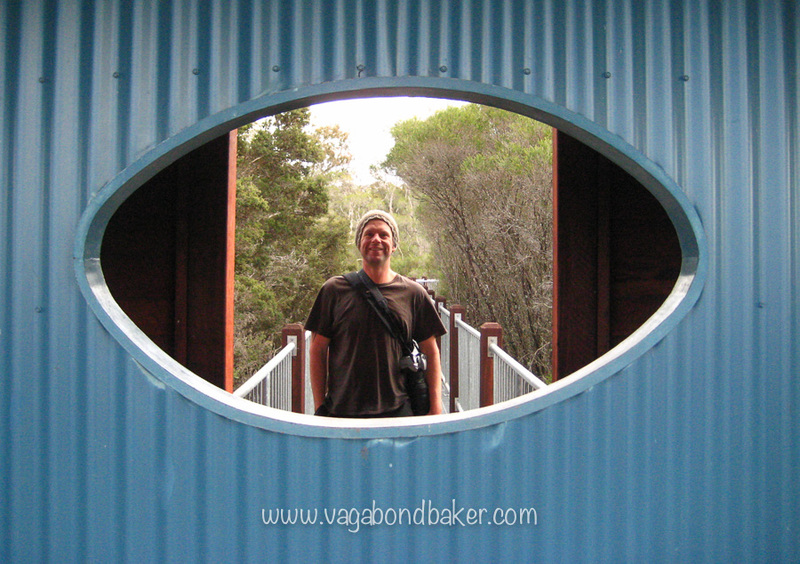 Next morning we packed up and drove out to a cove on the coast along a rocky unpaved road. From high up we could see lots of sea lions in the fierce waves on the headland so we clambered over some massive rocks to get a better view. The surf was wild but this didn’t seem to faze the sea lions who bobbed around in the water or lounged on their sides in the rocks. Further along the coast we stopped at a beach to watch the surfers, equally at home in the roaring sea. On the way down to Augusta we decided to blow the budget again and visit one of the show caves after the German couple mentioned how good they were. We opted for Jewel Cave and were taken underground in a tour group with a very informative guide. 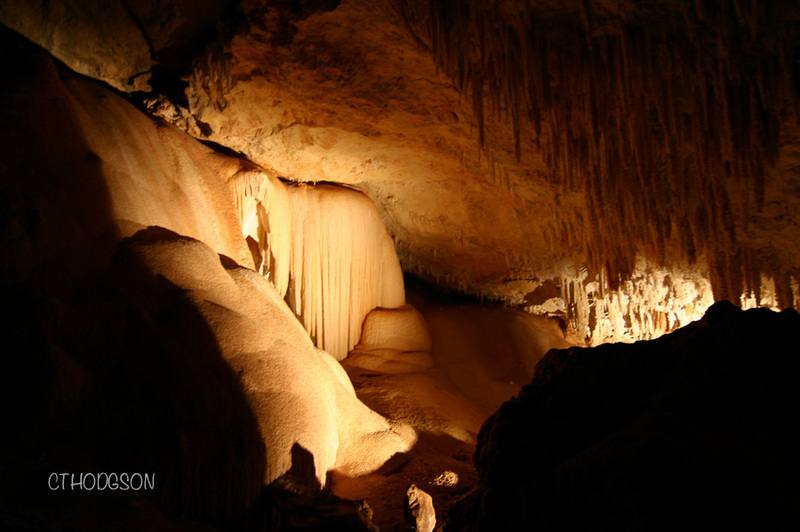 The cave was very long and very beautiful, crystallised stalagmites hung down from the chamber ceilings like sparking threads. There were cauliflower-like clusters and cape-like formations tainted orange with tannins in the water. The guide explained that the water level had dropped considerably over the last decade: drained by the thirsty vineyards, the caves were drying up. I overheard a woman in the tour group commenting that she thought someone was smoking, I quietly agreed with her, I could smell smoke too. 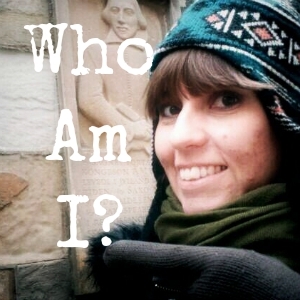 Then it dawned on me, it was me! 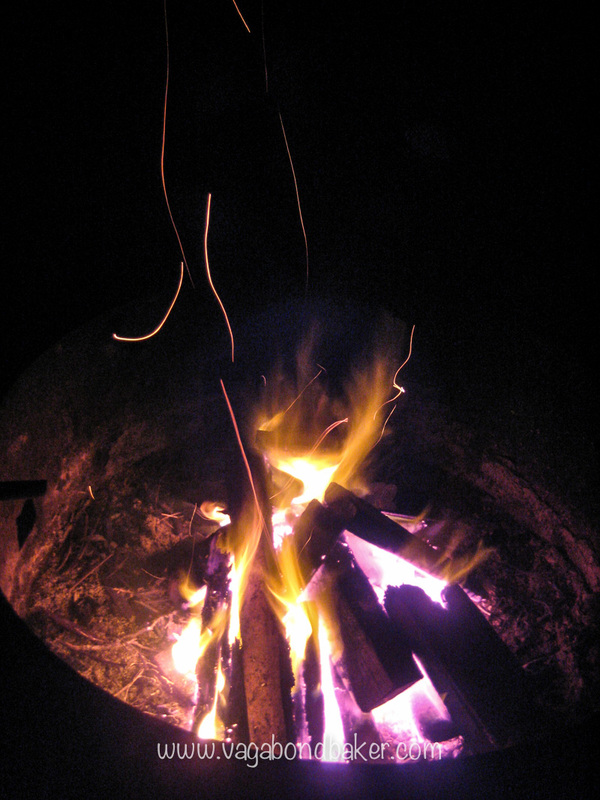 My jacket was thick with smoke from the campfire the previous night, I hadn’t noticed out in the windy outdoors but now I was confined in a cave the smell was overwhelming! We had lunch in Augusta, overlooking the small wooden waterwheel on the coast that had become petrified in limestone and was now like a man-made stone waterfall. At the Cape Leeuwin Lighthouse we looked out across two oceans, here the Indian and Southern oceans meet, at the most westerly point of the Australian continent. From Augusta we headed to Pemberton, leaving the coast behind us and heading into tall forests. 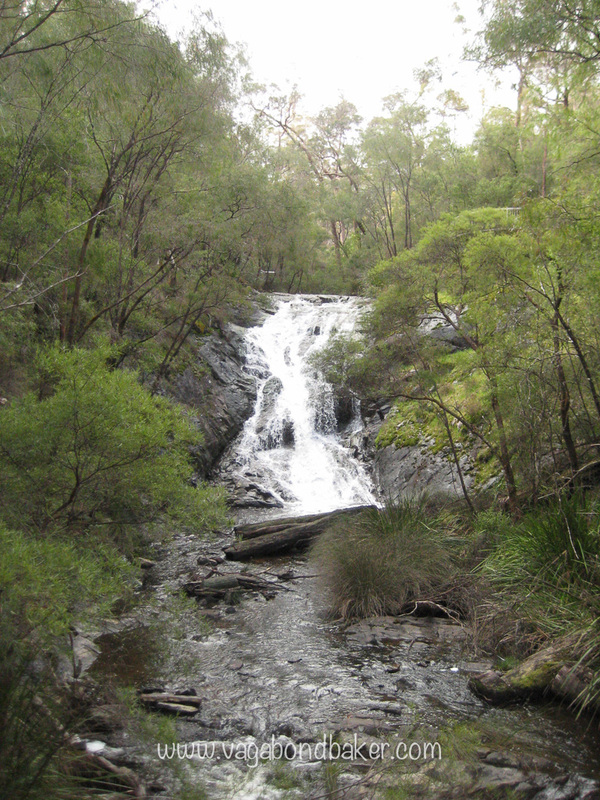 On the way we stopped at Beedelup Falls, stretching our legs on the short walking circuit – complete with wobbly suspension bridge – to the pretty waterfall. Giant trees flanked the road as we drove into the small town, setting up camp at the Pemberton Caravan Park. Next morning we had to hang our tent up to dry before packing it up, the cold, damp morning had left it covered in condensation, poor Chad took ages to start. 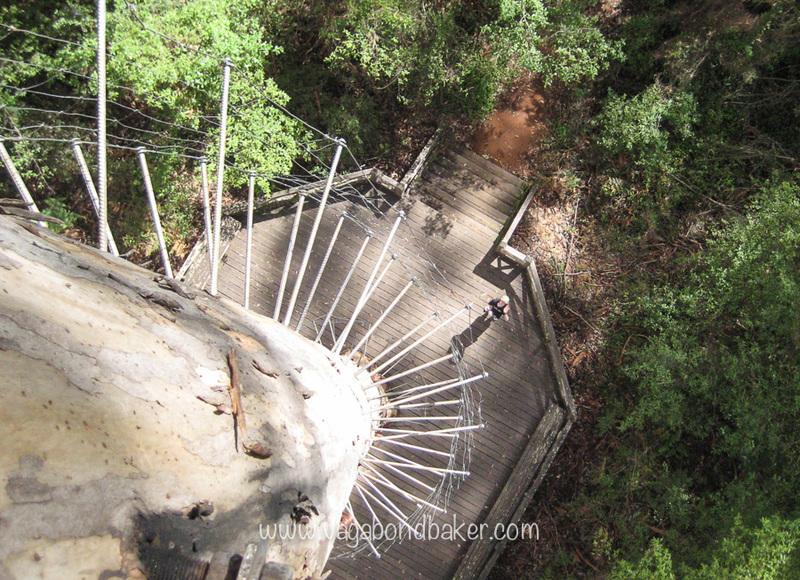 We spent the day exploring the majestic Karri forests, Chris climbed to the top of the 62 metre high Gloucester Tree, a tall karri tree that had been used as a fire-lookout. 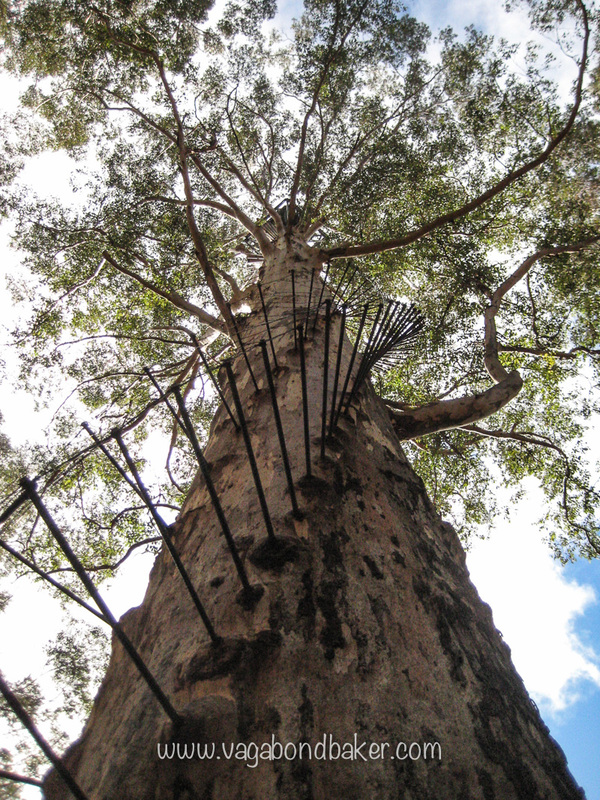 Steel pins had been driven into its trunk back in the 1940s, they spiralled up to a platform high up in the canopy. 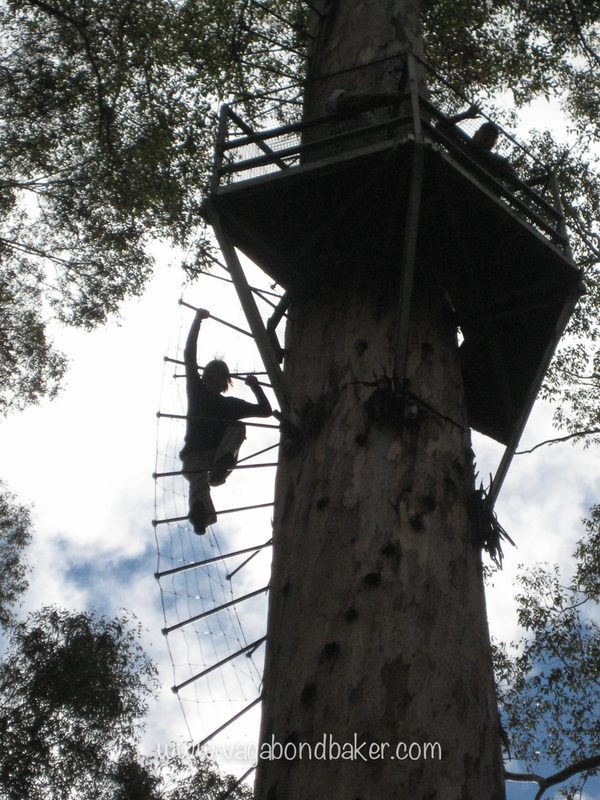 Amazingly, anyone can climb these trees now – at their own risk of course, a ladder to the sky! Chris was soon waving down to me from the top so I gingerly began to climb. The pins are quite widely spaced and I felt I could easily slip down between them, fear rose the more steps I took and I gave up at about eight metres from the ground. Frustrated by my defeat of the tree we drove to The Cascades, a flat waterfall nearby, but I felt irritable that I had let the tree win. 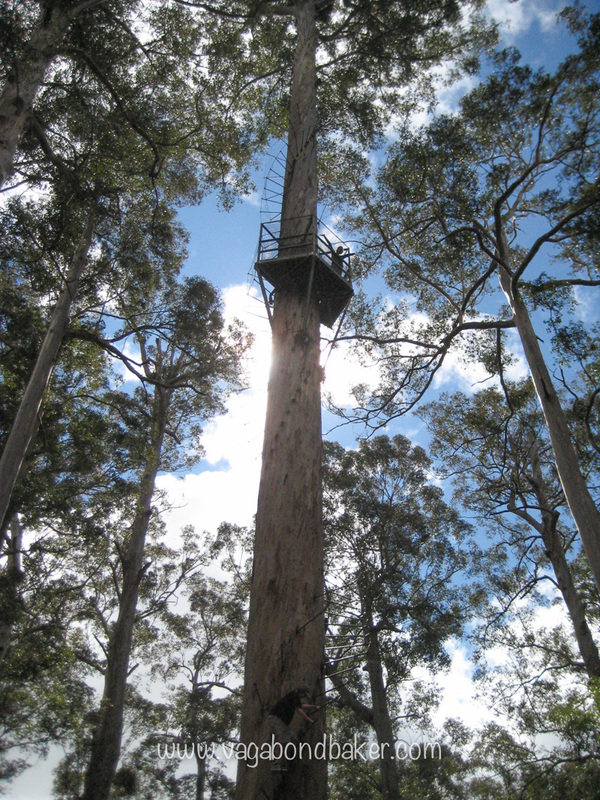 We moved on to the next fire lookout tree: the Dave Evans Bicentennial Tree, at 75 metres it is the tallest of the lookout trees. This tree was pegged in the 1980s and has a wire mesh on the outside of the pins – I could still slip though between them though! This tree had a platform at 25 metres, half way up the trunk, as well as the lookout platform at the top, and I set my resolve: I was going to climb to that platform! 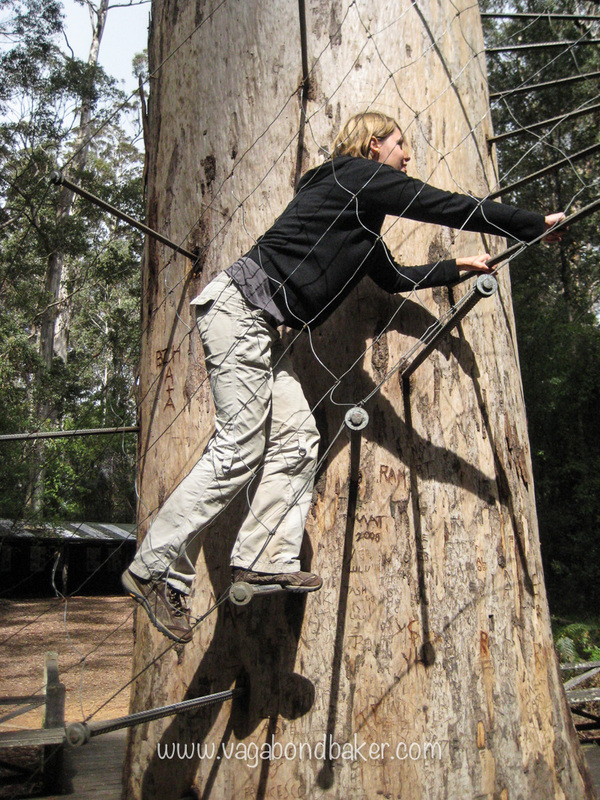 I began to climb, grasping on to the upper pins as I tentatively went from pin to pin: my palms were damp with fear-sweat! It seemed an awful long way down, I tried really hard not to peer past my feet. By the time I reached the midway platform my knees were like jelly but I felt great satisfaction from having faced my fears to get this far. This was as far as I was going to go though, I looked up and saw the rest of the steel ladder snaking up the tree and my whole being said no! To be completely honest, I wasn’t sure how I was going to get back down, the idea of going backwards down that precarious ladder was not appealing. It was a slow, wary descent! This is a far as I’m going! I was actually mighty pleased with myself for doing this, I can’t tell you how far out of my comfort zone that was! Travel had definitely changed me and given me new powers! That night we had a change from sleeping in our tiny red tent, we got a cute wooden hut instead. We’d driven to nearby Shannon National Park and found the campsite had two huts that cost the same as pitching a tent, both were free so we bagged one. 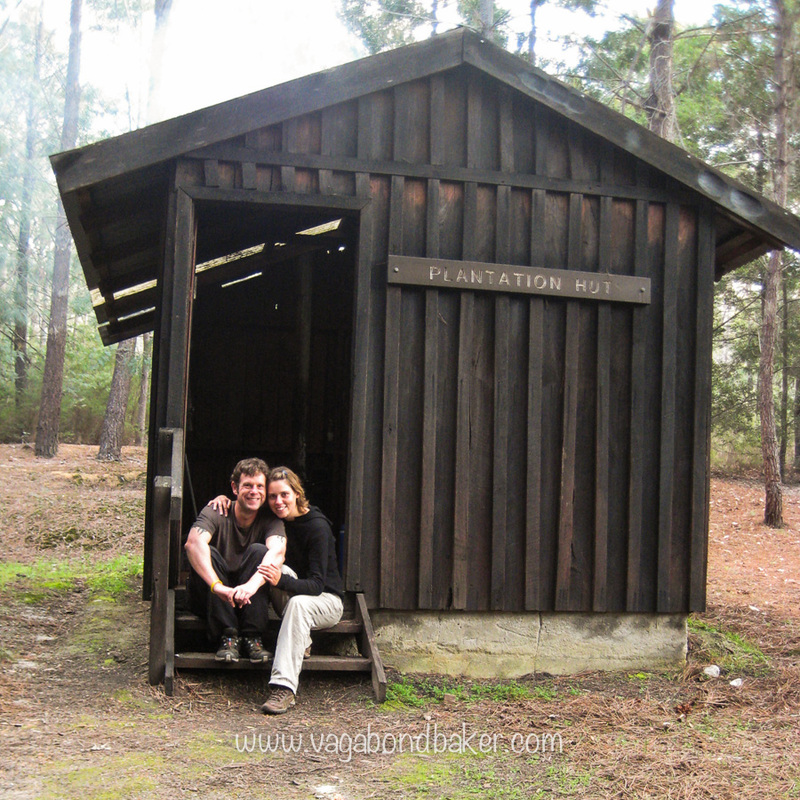 It was so gorgeous, our own little log cabin in the woods – Plantation Hut – with wooden bunks and a wood burning stove. 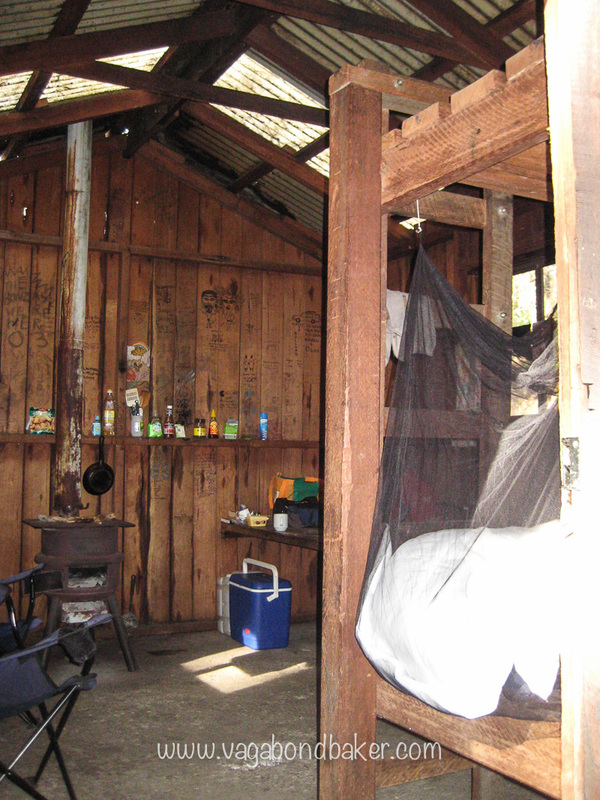 More in fear of spiders than mosquitoes, we strung up our mozzie net over the lower bunk, which was just wide enough for the both of us. 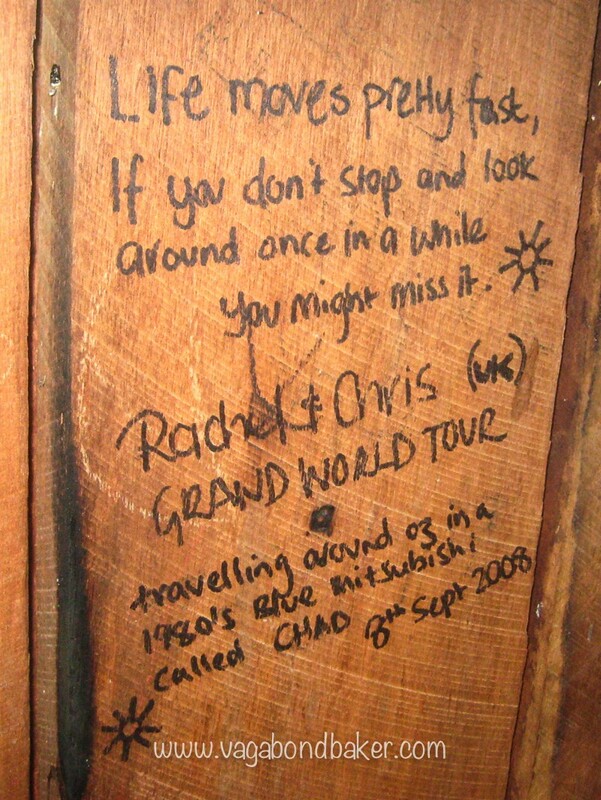 The wooden walls had been decorated by previous campers, each leaving a doodled memory, I added to it – I wonder if it is still there? After a brew, we took a wander along one of the park trails, it passed through an old abandoned logging settlement which was right next to the campsite, there was little to see and the old sports field was now a wild rectangle. The trail continued into the forest, Chris was on a mission to find a carnivorous plant that grows in the area – an Albany Pitcher Plant, he’d had some in the past and wanted to see it growing wild in its native environment – and we scoured the trail for it. 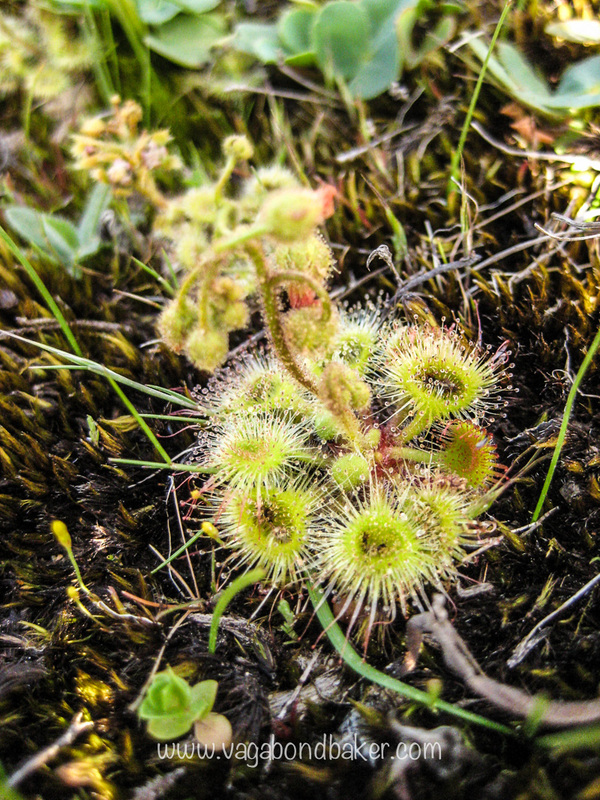 That particular plant didn’t appear but we saw plenty of dainty sundew. 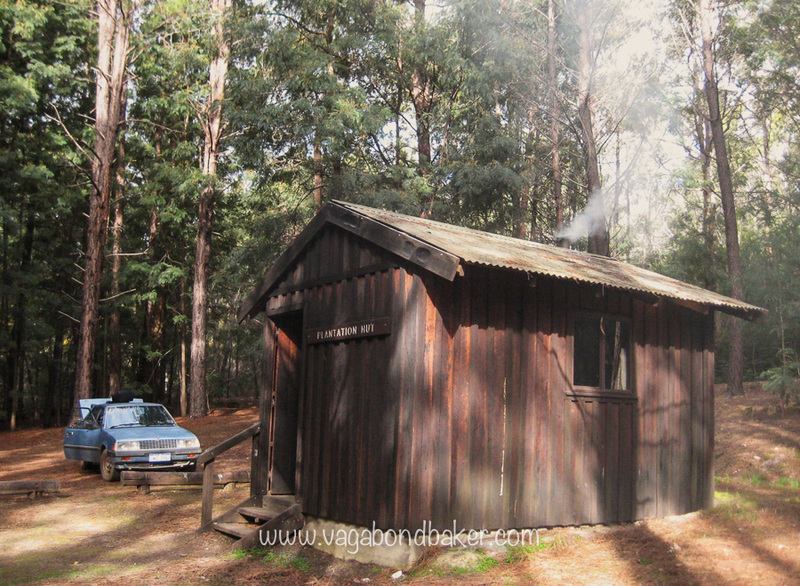 The hut was so cosy we decided to stay on an extra night, using the day in between to have a little drive around the area. 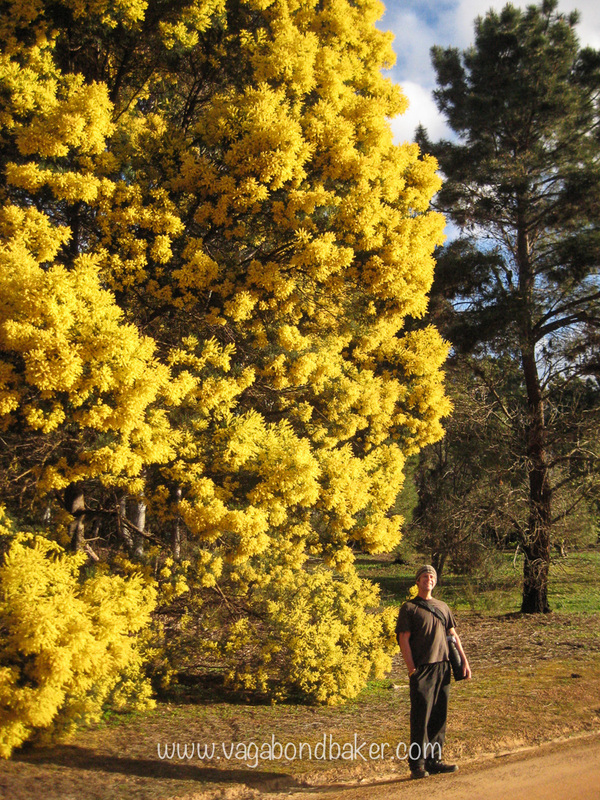 We had a look around Muir Lake then drove to Manjimup for groceries. There were some fabulous op shops there with some random clothes, I was so tempted with a glittering tight black catsuit: it was so 80s, it would have been on theme with Chad, our 80’s car! Lunch was devoured at the last of the three lookout trees: Diamond Tree, although neither of us climbed it. Vacating Plantation Hut, we moved on the Walpole where the Tourist Info had a free, unadvertised, hot shower: bloody marvellous! The lovely lady on the desk gave Chris some pointers for finding his pitcher plant but all were fruitless. Coalmine Beach lookout gave us a pretty view for lunch then we headed back into the forest to see the Giant Tingle Tree. The big tingle trees are extraordinary, they are hollowed out from the base and many are completely burnt inside, like charcoal. 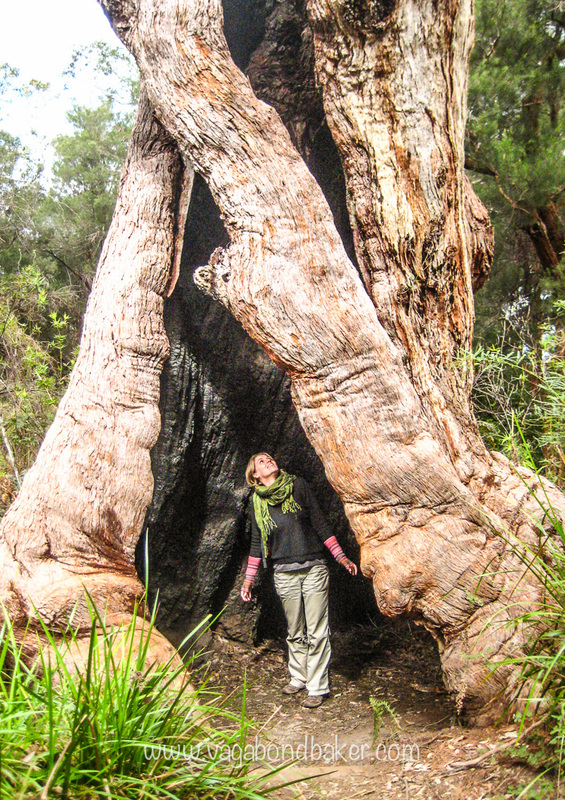 The Giant Tingle Tree is enormous, the cavity inside is spacious enough for a transit van with room to spare! We had fun taking photos. 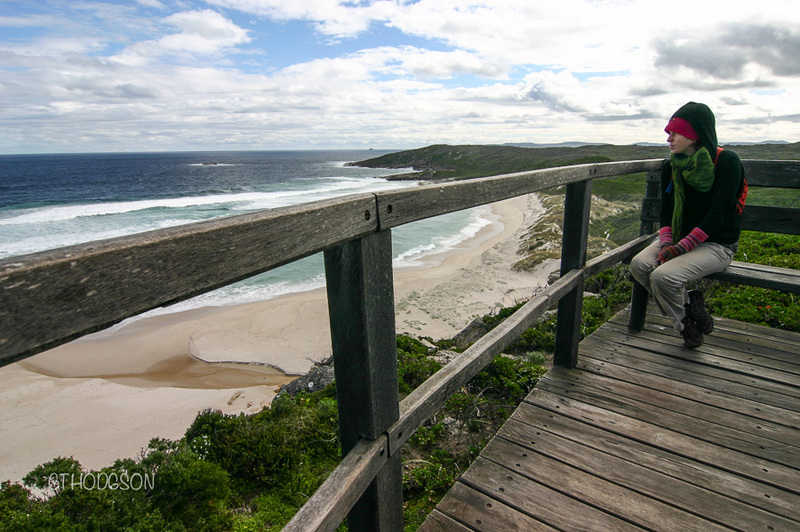 Our hunt for the pitcher plant took us to the whale lookout at the wonderfully named Conspicuous Beach where is was wildly blustery: no whales and no Albany pitcher plant. 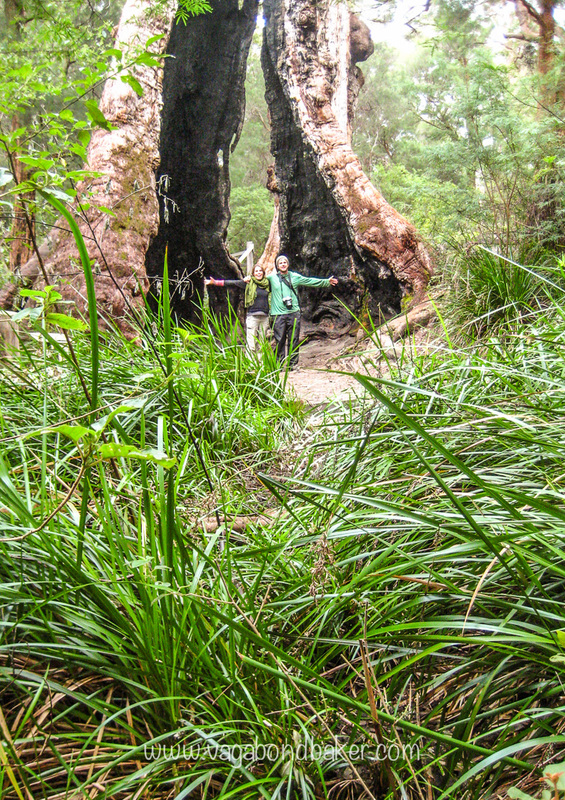 The following day we visited the Valley of the Giants, after camping the night at Peaceful Bay Caravan Park. 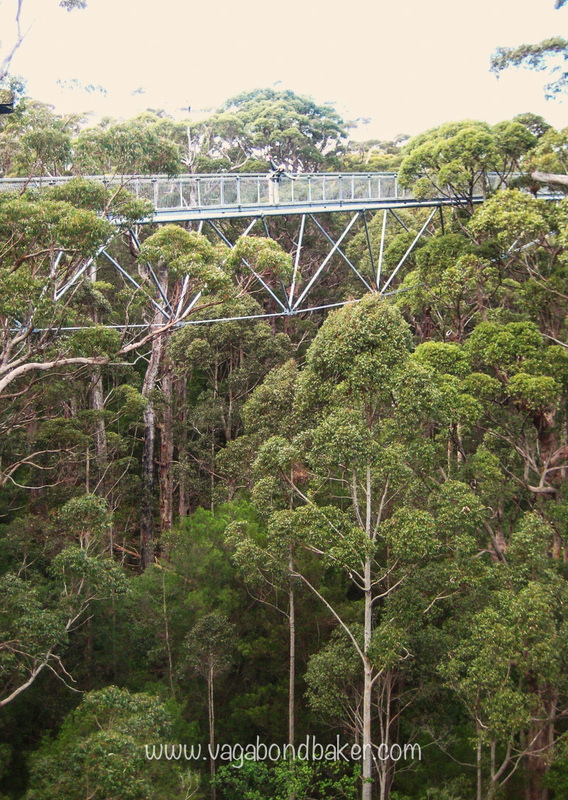 Among the tall trees here is a 40 metre high raised walkway in the canopy. I was challenged with my fear of heights again, strolling from tree to tree in the drizzle. A few birds flitted among the branches and it was good to get a more relaxed view of the forest canopy without the stress induced by the lookout tree ladders, this experience didn’t feel dangerous, the walkways turned out to be very sturdy! For maybe something not to do, we stopped at The Dinosaur and Parrot Park after seeing it on the road map, oh boy did it sound exciting! No, no it isn’t, it was a waste of AUD $24 and we ended up leaving with bruises. They had some replica dinosaur bones, replicas of the actual bones we had seen for free in Melbourne museum. A DVD was playing Walking With Dinosaurs and some live reptiles were dozing in vivariums. Outside there were aviaries as well as some free-flying parrots including one characterful corella named Eddie. Eddie was quite cute at first, sidling up to Chris and laying his head on Chris’s foot in a bid for attention. Chris gave him a little scratch and it bit him! It then hopped over to me and bit me on the leg, then again, and again, I had to fend him off with an umbrella! This was not the fun experience we were hoping for! 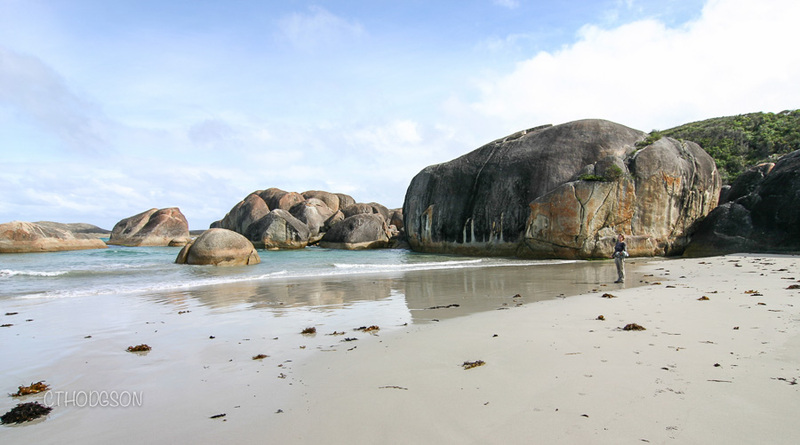 We escaped the vicious beak of Eddie and carried on south to Denmark, pausing to take a look at Elephant Rocks, huge rock formations in a cove in William Bay. The giant rocks look like elephants paddling out to sea, they made us feel tiny and had the air of something very prehistoric. 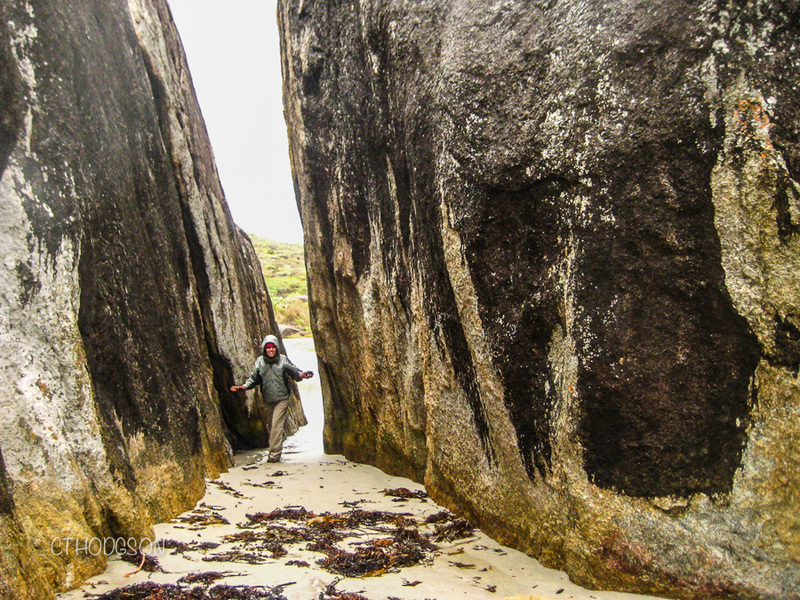 It was raining hard, zipping up my jacket we headed down some wooden steps and emerged onto the beach through a narrow crevasse. 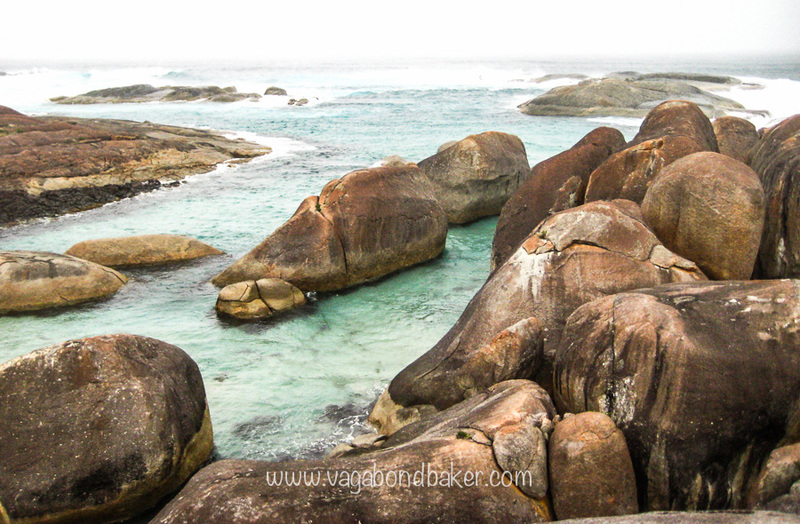 The wet, salty wind whipped around us as we explored among the rocks, the waves crashed violently beyond the shelter of the colossal boulders. 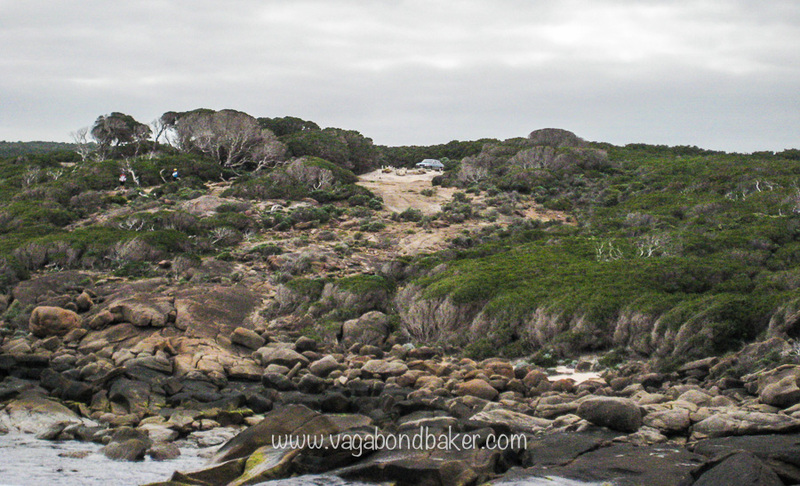 Just before Albany, we camped the night for free at Cosy Corner public camp, right next to a beach. It rained all night, our tent wasn’t totally watertight and the bottom of the bed was soaked by morning. 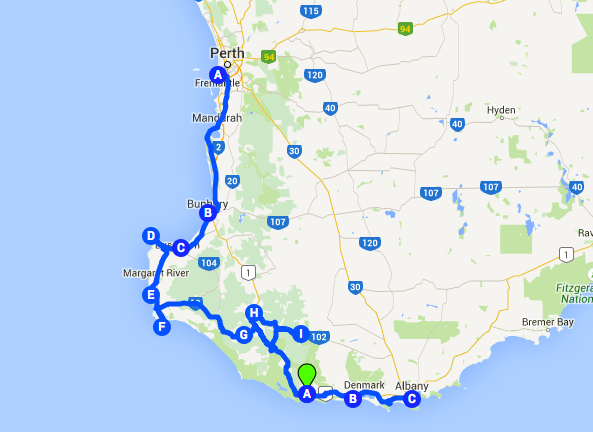 The rain still poured as we drove into Albany; We’d clocked up another 950 kms – in seven days – of our road trip. 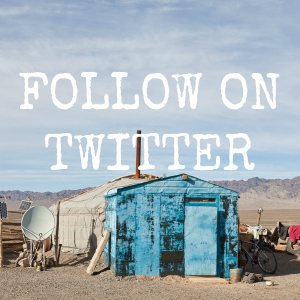 Coming next, the journey continues into South Australia and Chad crosses the Nullarbor! 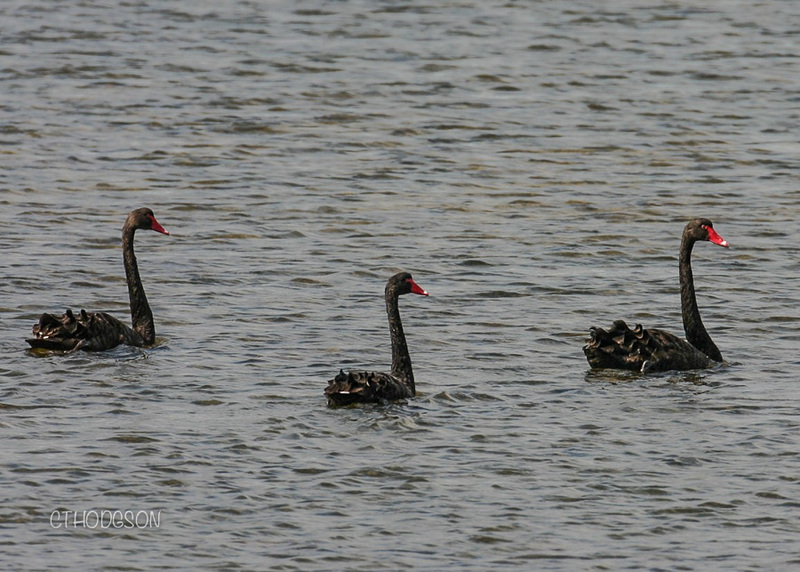 Magnificent photos of the blue wren and the three black swans. 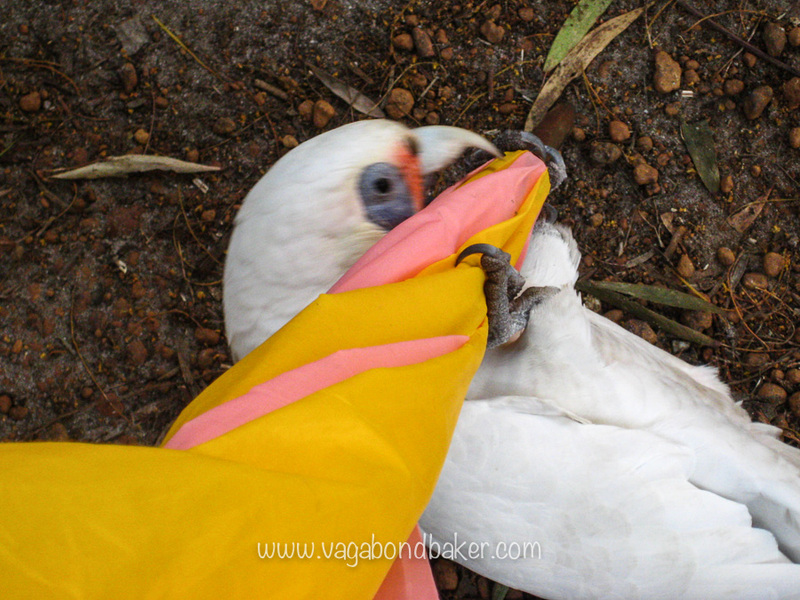 Funny that you had to fend off the parrot with your umbrella! Thank you so much Suze! I can’t take credit for the bird photos, that’s all down to my other half- that’s what he does! At the time, that parrot scared me to death! Hahaha, I love all the little animals of this world but oh, that parrot! He was mean! Thanks Dave! 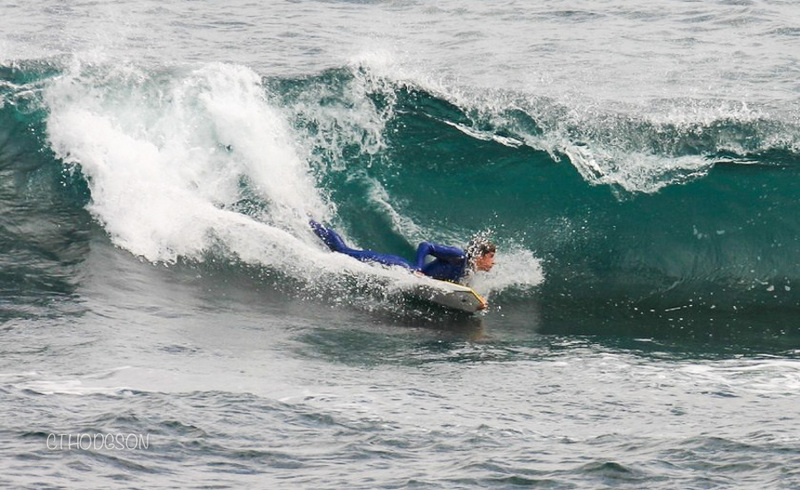 Yes, you should totally go to Australia for surfing! There wasn’t much of a view from the middle platform, just out into the trees. Chris said he could see over the top of the canopy from the top, that must have been really cool! I guess that was the point of them, to be above the trees to spot fires. The elephant rocks were a lovely surprise, very different from stuff we’d seen along the coastline up to then. 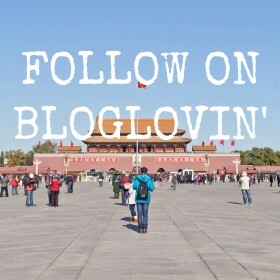 You must be getting excited for your travels soon! 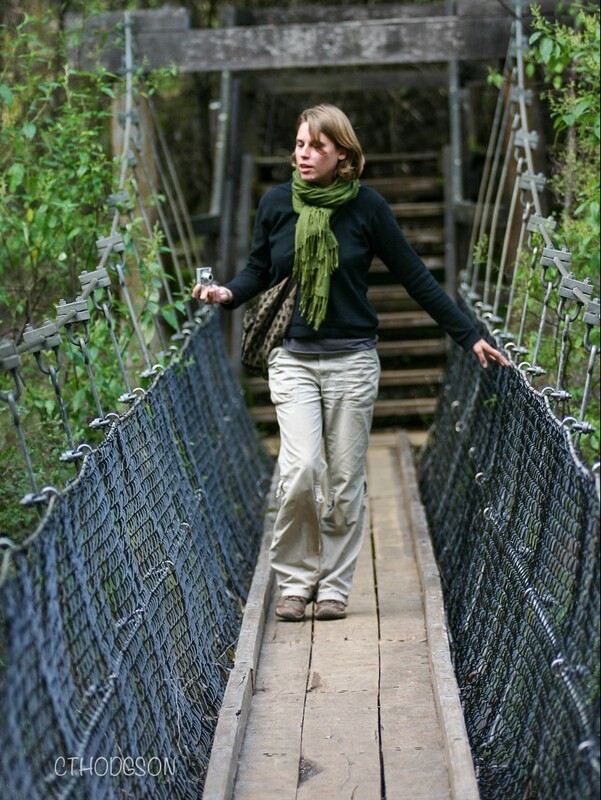 Another good read Rachel and this time I can relate as we toured the South West corner some years ago in a campervan! I was like you the fire trees scared me, got a few steps up and went “no can’t do this” and bolted back down! Vaughan shot up with no fear at all as he does. I love the camp grounds, they had the best cooking shelters. Yes those parrots bite, Ive nearly lost a finger to one or two!! your blog brought back some great memories of that pretty part of WA 🙂 looking forward to the next instalment.. Cheers Jayne! Really? they scare you too? I’d have thought you’d have been brave enough for that! I’m not surprised Vaughan climbed them though, Chris was exactly the same! 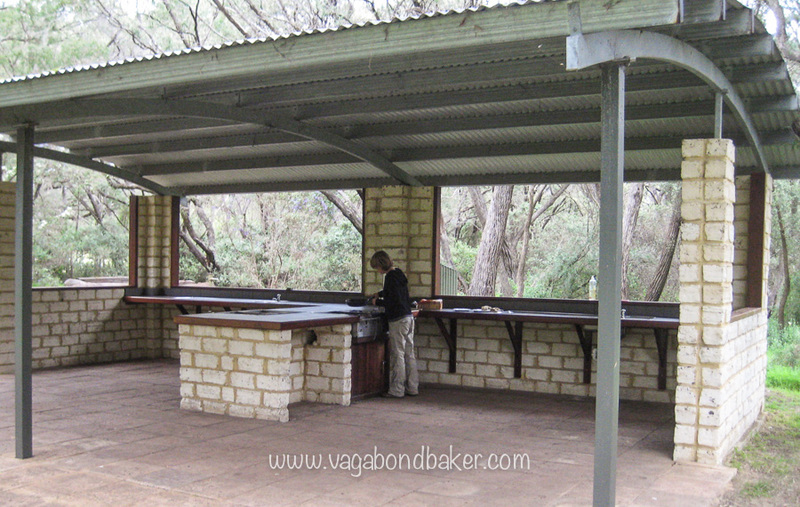 I love the fact there are camp kitchens, such a rare thing in the UK: are there any? Glad to bring back some memories! The cave and the birds look quite interesting ! Thanks Gin, the cave was very interesting, the guide we had was excellent. 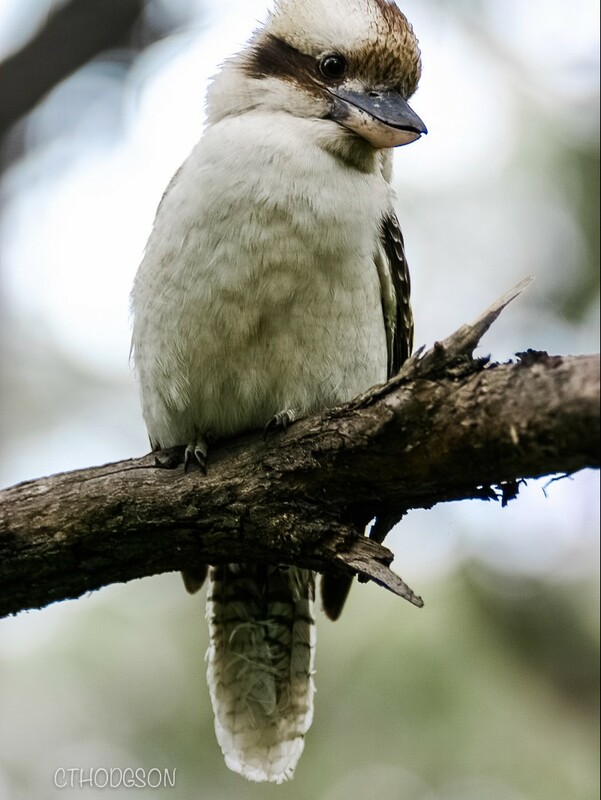 I loved the amazing Australian birdlife, so varied and different from what we have here.